This is an additional power point to use with Module 1, Unit 2 Lesson 5. 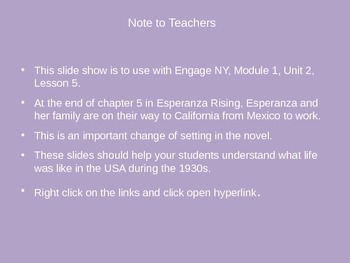 It includes information needed for the setting change in the novel Esperanza Rising. 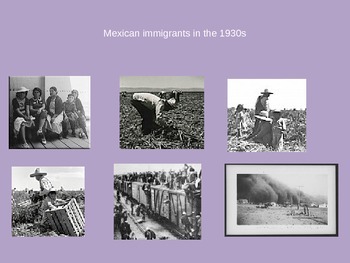 Esperanza and her family are leaving Mexico and heading to California to work. 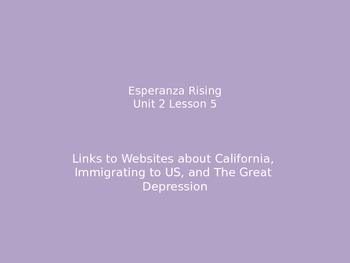 This PP includes the following: Lesson 5 lesson plan, additional information about the three categories introduced, California in the 1930's, Immigration from Mexico, and The Great Depression. It also includes websites and pictures of each. In closing it includes a writing assignment.